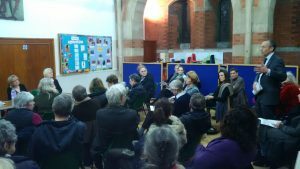 Our launch meeting filled a hall at Holy Innocents Church in Paddenswick Road. The meeting was supported by the Council and our MP, and filmed by the BBC (broadcast details will be sent out when known). It resulted in a 50% increase in members, a doubling of our funds and more volunteers for the Management Committee. Not knowing what it was like to live under a flightpath was identified as a key challenge for residents of Shepherds Bush and much of Hammersmith as they do not currently experience significant aircraft noise.